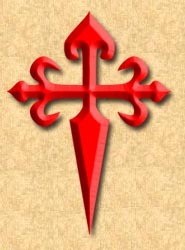 The Order of Santiago was founded in the 12th century under the patronage of Galicia and Spain, Saint James the Greater. It was under his patronage that the Christians of those two locations began the fight in the 9th century against the Muslims in the Iberian Peninsula. In fact, this order helped to drive the Muslims from the peninsula. Part of their responsibilities included resettling land reclaimed from the Muslims. 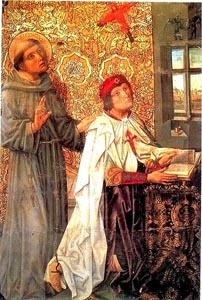 As was common in knightly orders of the day, the Order of Santiago had a character similar to a religious order. Unlike other orders, however, that followed the severe rule of the Benedictines of Cîteaux, the Order of Santiago adopted the less strict rule of the Canons of St. Augustine. The order is both hospitaller and military, like the Knights of Malta. In addition to monasteries, they also operated at least one leper hospital. The Order of Santiago was recognized as religious by Pope Alexander III, whose Bull of in 1175 was later confirmed by more than twenty of his successors. These pontifical acts gave them all the special privileges and exemptions of monastic orders. They also enjoyed the support of King Ferdinand of Aragón who had granted it title to the original headquarters in 1171. Their headquarters later moved from Caceres to Ucles after the loss of Caceres, the castle at Ucles having been granted by King Alfonso IX of Castille. They were granted extensive properties in Portugal, including the town of Palmella, and later acquired properties in France, Italy, Palestine, Carinthia, Hungary and England (Desmond Seward. The Monks of War. Eyre Methuen. 1972.). Like the Templars and Hospitallers, they quickly gained much feudal power and land, both by gift and by conquest. The new areas they established would be centered around a fortified structure, such as a castle, with garrison support and village networks built around it. The order at the time comprised various classes. These were Canons, charged with the administration of the sacraments; Canonesses, occupied with the service of pilgrims; Religious knights living in community, and married Knights. The right to marry, which other military orders did not obtain until the end of the Middle Ages, was granted to them from the very beginning. However, this right was subject to certain conditions, viz., the authorization of the king, and the obligation of observing continence during Advent, Lent, and on certain festivals of the year, which time they spent at their monasteries in retreat. Wives of knights were obliged to make the same proof of nobility as their husbands. Qualification for membership entails proving four noble quarterings. However, until 1653 it the paternal line merely had to be noble of any antiquity (Guy Stair Sainty. "The Military Order of Santiago." Almanach de la Cour. Undated.). Novices to the order had to serve in the galleys for six months and live in the Convent of the Order to study its rule for one month. Candidates could obtain a dispensation from these duties by payment of a sum of money, which was, by the eighteenth century, purely nominal. Knights were required to profess the vows of poverty, obedience, and (marital) chastity. In 1652 the Chapter-General added a fourth vow to defend and sustain the Immaculate Conception of the Virgin Mary. Today the order remains in the Kingdom of Spaind. The Commendador-Mayor of Castille is the Prince of the Asturias. The Commendador-Mayor of Leon is the Count of Bornos. The Commendador-Mayor of Montalban is Don Alfonson de Zuleta y Sanchiz. The order has thirty-five other professed knights and thirty novices. Novice knights are still required to prove not only the nobility of each of their four grandparents, but also that they, both their parents, and all four grandparents are legitimate and not descended from non-Christians or heretics. (However, descent from a protestant ancestor has long since been removed as a barrier to membership.) Novice knights also must be practicing Catholics in good standing. Copyright 1996-2012 Knighthood Information Center.